From the Pacific coast of Oregon in the Northwest, the path of totality swept down through the prairies of Kansas and Nebraska, toward the Midwest, leaving the southern tip of Illinois, passing through the Southeastern states of Kentucky and Tennessee, before exiting on the Atlantic beaches of South Carolina. Along that path our employees and friends reported through our blog what they saw. Here’s a recap of what they saw. Left: Solar Lab 20″ Heliostat sending light through optical window to solar scopes. Right: Heliostat on tracks outside Lab. Copyright Stephen Pizzo. Pre-eclipse, we blogged about our correspondence with Stephen Pizzo. He was preparing to run the NASA Solar Lab: a portable solar observatory designed to broadcast the eclipse in Hydrogen-α, Calcium k-line, and white light. A RED Dragon Epic monochrome 18-megapixel cinema camera was attached to each scope. These would record at 80-frames-per-second with a dynamic range of whopping 24-stops to produce the “highest resolution still and time imagery of a solar eclipse.” Stephen used 2x and 4x Powermates™ on the scopes to extend their effective focal length to 3,600mm or 6,400mm for breathtaking, close-up images of the activity on the Sun’s chromosphere. 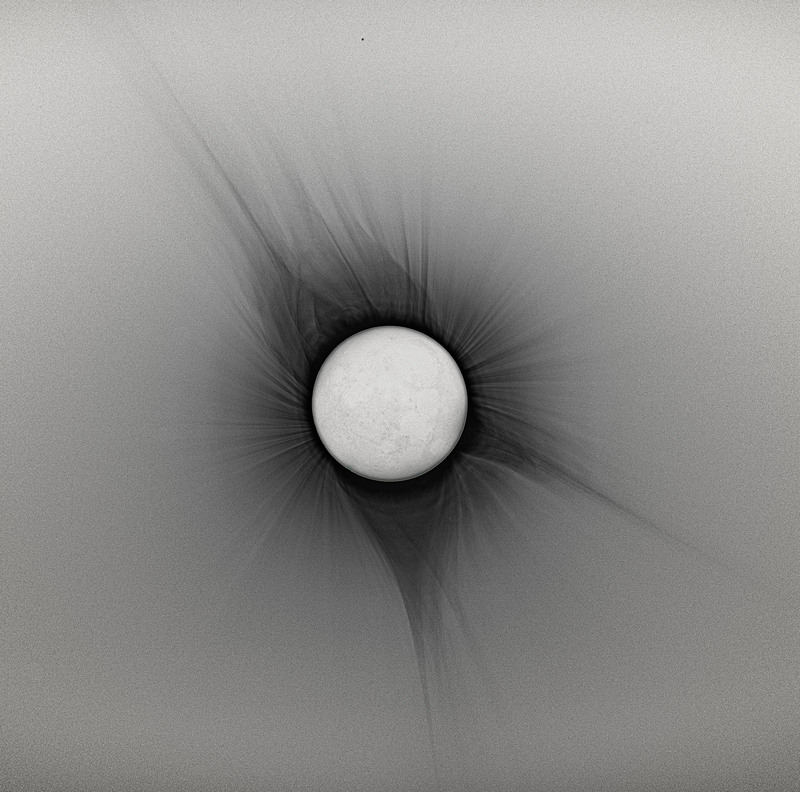 A mesmerizing pre-eclipse image of solar activity frozen in time: swirling jets of gas encompass a dark sunspot and accompanying bright plages near limb of the sun — while spicules dancing along the solar horizon. 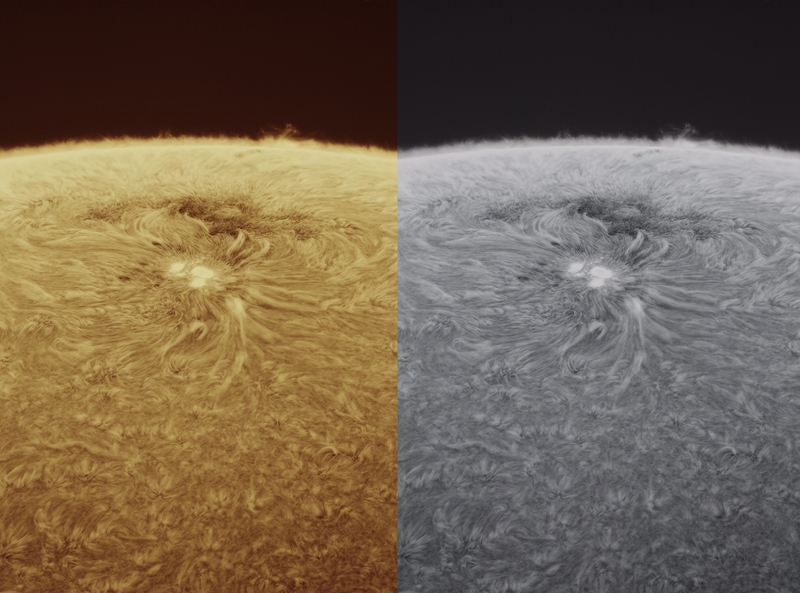 Monochrome and colorized, hydrogen-α image with Lunt LS230THa scope and Tele Vue 4x Powermate™ into RED Dragon Epic 18MP monochrome camera . Copyright Stephen Pizzo. The Solar Lab’s broadcast took place at Southern Illinois University in Carbondale, IL. You can read our Inside the SOLAR LAB blog post from August 9, 2017. 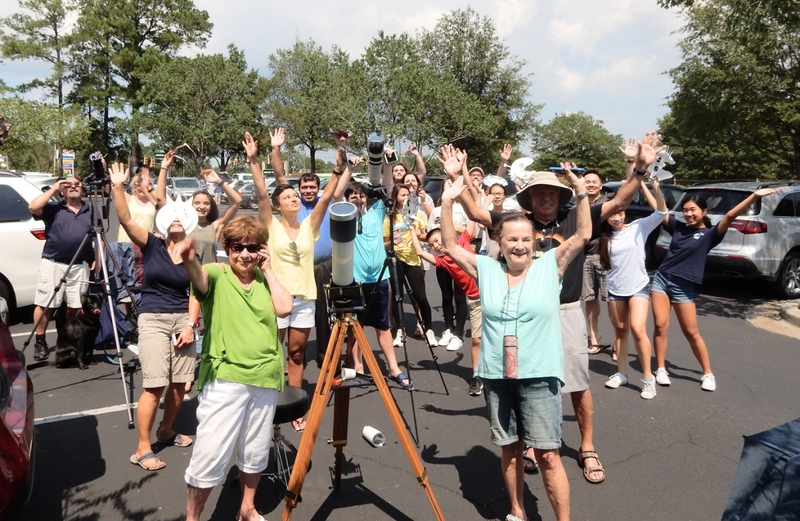 Gary Parkerson, the Pedaling Astronomer (and Astronomy Technology Today magazine editor), wowed the crowds on eclipse day in Nashville, TN by showing them the view on his smartphone through a Tele Vue TV-60 with FoneMate™ adapter. His appearance at the eclipse included live updates on the Weather Channel. He was also covered by local news stations in the area. 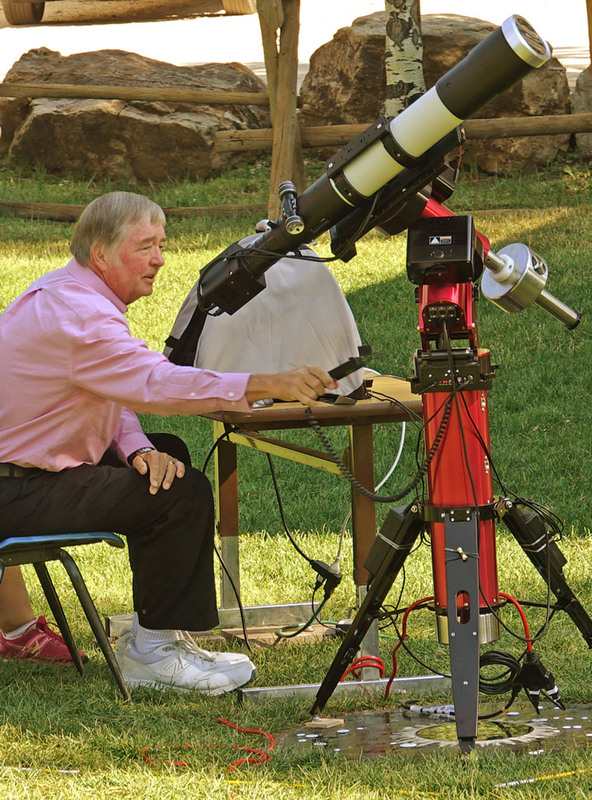 While most of our friends were conducting casual observations, one was conducting a dead-serious experiment: Dr. Don Bruns, at the Astronomical League convention in Casper, Wyoming, attempted to measure star-position deflection near the sun with our Tele Vue-NP101is telescope. His goal was not just to duplicate the famous 1919 experiment that proved Einstein’s General Theory of Relativity, but to achieve the best results ever using readily available amateur astronomy equipment. For his ground-breaking efforts, Dr. Bruns received the American Astronomical Society’s Chambliss Amateur Achievement Award in 2018. Dr. Bruns with the NP101is preparing for the solar eclipse observing run in Casper, WY. 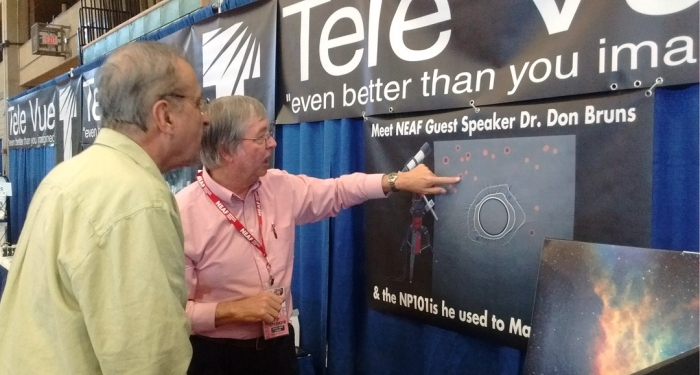 He appeared this spring as as speaker at the Northeast Astronomy Forum (NEAF) to present his results and spend some time answering questions in our Tele Vue booth at the show. Read about Dr. Bruns’ breakthrough citizen science experiment on our May 4, 2018 blog post: Dr. Bruns at NEAF 2018. Our webmaster and social media scribe traveled 14-hours by car to witness the eclipse in Tennessee. After deciding not to drive further-on to Nashville, he wound-up in a field in the farming community of Tellico Plains — with a great view of the foothills of the Smoky Mountains. Tele Vue TV-85 stack of various exposures at totality – shown as a negative. Courtesy Peter Carboni. 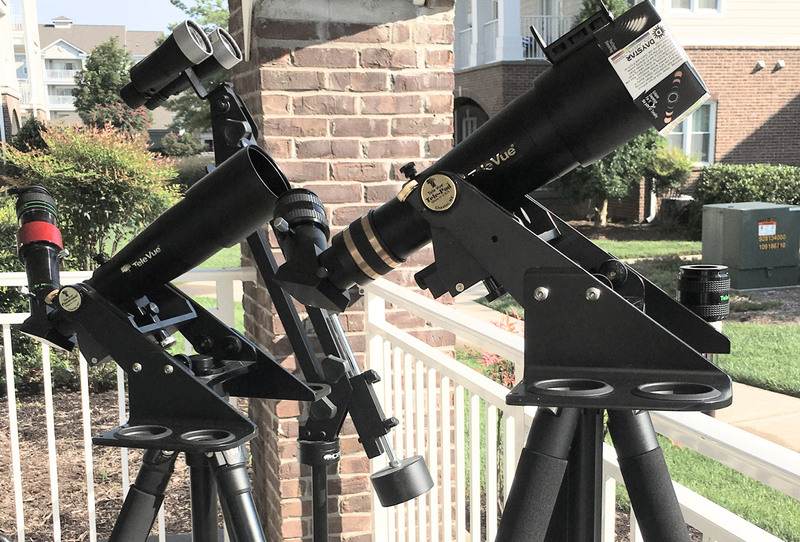 Equipped with a Tele Vue TV-85 APO refractor, with TRF-2008 0.8x Reducer / Flatnner, he proceeded to photograph totality and all the phases with a SONY A7 II mirrorless interchangeable lens camera. He describes the advent of totality in the following paragraph. You can read more about his experiences in our August 30, 2017 blog post: Totality in Tellico Plains, TN. 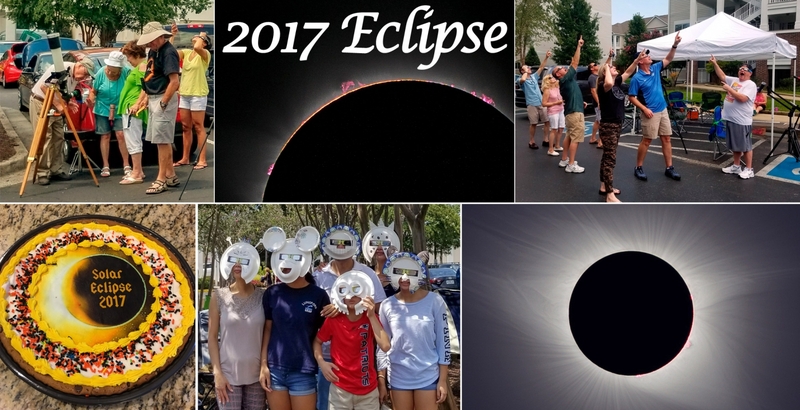 At the Hilton Embassy in Columbia, SC, Tele Vue co-founders Al and Judi Nagler met up with friends (some they just met) to gaze at the eclipse through Al’s Tele Vue TV-NP101 equipped with FoneMate™ smartphone adapter. A crowd quickly forms to view the eclipse on the smartphone screen. Seeing the gorgeous flaring corona around an absolutely black solar disc, with lovely pink prominences peeking around the edges, AND Regulus sparkling near the edge of the 100° (Apparent Field of View) eyepiece field, was indeed visual magic. Al and Judi also had time to tour the telescope exhibit at the South Carolina State Museum and meet Apollo 16 Lunar Module Pilot Charles Duke — all in one trip! Read Al’s September 6, 2017 View of a Lifetime! 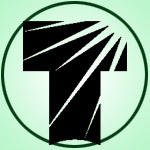 blog post. The time before totality was spent on solar viewing. In the foreground a pair of Tele Vue TV-60 APO scopes fitted for white-light and Hydrogen-alpha filters. Behind are a pair of white light filtered, 7×50 binoculars on a parallelogram mount. With a tent setup in the parking lot, and plenty of food, drink, and telescopes setup, an extended crowd materialized around them. But as eclipse-time drew nearer: so did the clouds! Can’t have an eclipse party without food and drink: BBQ brisket , eclipse wine, giant eclipse cookie. Stills from smartphone video show totality and diamond-ring effect at end of eclipse. Read David Nagler’s epic September 28, 2017 blog post: Naglers in Nashville, TN! Previous Previous post: August Skies and Smashed Eyepieces!